NYC has woken up and come to its senses. After 20 years of GOP mayors who hated us and everything we stood for, the city has elected a progressive-minded mayor, a mayor who seems to value not only working people, but also the people who professionally serve the city. I went to see him speak in Brooklyn during the campaign, heard him say so, and have no reason to doubt his word. We have a new chancellor, Carmen Fariña, who not only taught, but taught for decades. There will be no more talk about how tenure and seniority promote mediocrity, and no more fanatical ideologues in Tweed preaching privatization. Of course, no one is perfect, and Fariña has not yet come to her senses about Common Core. But she recognizes its miserable implementation, as does everyone on earth save those who actually implemented it, Reformy John King, Merryl Tisch, and their army of private interns who do not answer to we, the people. The New York Post is horrified. De Blasio isn't opening any more charters! 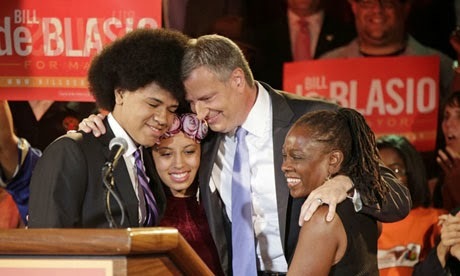 De Blasio may charge Eva Moskowitz rent! Gazillionaires may have to pay more taxes to support pre-K for the children of the bootless and unhorsed! I smile at every one of Murdoch's perceived outrages. It's about time we had a mayor who was concerned with helping our children rather than comforting the comfortable. Finally the UFT President has come around to support our new mayor's pre-K plan. AFT President Randi Weingarten, who once ridiculed the program, appears to have come to her senses as well. Now Mayor de Blasio's prime obstacle is Governor Andrew Cuomo, self-described student lobbyist, who's helped our kids tremendously by funding most schools at a lower rate than six years ago. Cuomo's vision of saving the millionaires appears woefully inadequate. When you want to actually improve things, rather than simply give the appearance of doing so, you need to find a way to pay for said improvements. It appears the mayor, unlike the governor, has actually thought this through. So we are at an impasse. We can follow the mayor and support his vision, or we can listen to our governor, the one who was elected based on promises of going after unions, and hope for the best. It's sad that a Democrat can run on a plank like this, but Andrew Cuomo is not fundamentally a Democrat. Like Michael Bloomberg, who overturned the twice-voiced will of the people to buy himself a third term, Cuomo is a relentless and unapologetic opportunist. His goal is to be President of the United States, and if that entails taking money from DFER and their sleazy corporate allies, so be it. I'm glad UFT leadership has come to its senses and supported the mayor, albeit a little late. It now behooves us to stand up for what's best for the kids we serve. Unfortunately, "student lobbyist" Cuomo is not responsive to the public. For example, the public now opposes Common Core by a wide margin. Rather than stand up and risk the wrath of his corporate supporters, Cuomo has created yet another panel to study what we already know. Cuomo has seen fit to include not only a member of E4E, which in no way represents teachers, but also to have an IBM executive as chair. It's pretty clear how much Governor Cuomo values teacher voice. When Reformy John King publicly declares public school parents and teachers to be "special interests," he offers not a whisper of rebuke. But here's the thing--John King was right. We are most certainly special interests, and our special interest is the public school children of New York. It's an abject disgrace that neither John King nor Andrew Cuomo shares that special interest. But we will not waver in advocating for better education, reasonable standards, and developmentally appropriate treatment of our children. If Cuomo and King do not share our vision, that's a shame. But it's not their job to agree with us. It's their job to help and serve us. And it's our job to make sure they do their job.